When I saw the photo, I could scarcely believe it was the same country. The picture of Brighton Beach in 1976 featured in the Guardian a few weeks ago appeared to show an alien race. Almost everyone was slim. I mentioned it on social media, then went on holiday. When I returned, I found that people were still debating it. The heated discussion prompted me to read more. How have we changed so far, so fast? To my astonishment, almost every explanation proposed in the thread turned out to be untrue. 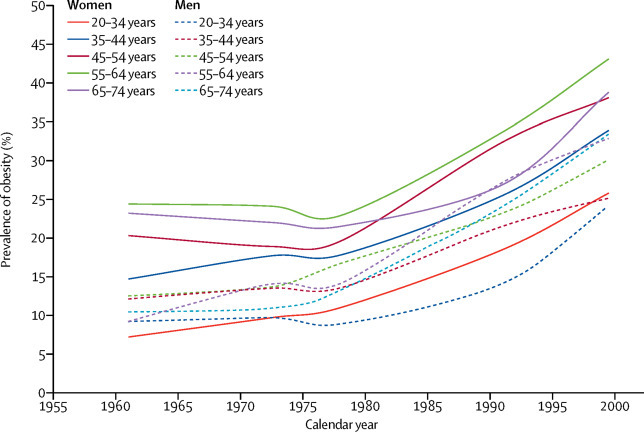 Unfortunately, there are no consistent obesity data in the United Kingdom before 1988, at which point the incidence was already rising sharply. But in the US, the figures go back further. They show that, by chance, the inflection point was more or less 1976. Suddenly, at around the time when the photograph was taken, people started becoming fatter, and the trend has continued ever since. The obvious explanation, many of those debating the photo insisted, is that we’re eating more. Several pointed out, not without justice, that food was generally disgusting in the 1970s. It was also more expensive. There were fewer fast food outlets and the shops shut earlier, ensuring that if you missed your tea, you went hungry. So here’s the first big surprise: we ate more in 1976. According to government figures, we currently consume an average of 2131 kcals per day, a figure that appears to include sweets and alcohol. But in 1976, we consumed 2280 kcal, excluding alcohol and sweets, or 2590 when they’re included. Can this really be true? I have found no reason to discredit the figures. Others insisted that the cause is a decline in manual labour. Again, this seems to make sense, but again the data don’t support it. A paper in the International Journal of Surgery states that “adults working in unskilled manual professions are over 4 times more likely to be classified as morbidly obese compared with those in professional employment”. So how about voluntary exercise? Plenty of people argued that, as we drive rather than walk or cycle, are stuck to our screens and order our groceries online, we exercise far less than we did. It seems to make sense – so here comes the next surprise. According to a long-term study at Plymouth University, children’s physical activity is the same as it was 50 years ago. A paper in the International Journal of Epidemiology finds that, corrected for body size, there is no difference between the amount of calories burnt by people in rich countries and in poor ones, where subsistence agriculture remains the norm. It proposes that there is no relationship between physical activity and weight gain. Many other studies suggest that exercise, while crucial to other aspects of good health, is far less important than diet in regulating our weight. Some suggest it plays no role at all, as the more we exercise, the hungrier we become. Other people pointed to more obscure factors: adenovirus-36 infection, antibiotic use in childhood and endocrine-disrupting chemicals. While there is evidence suggesting they might all play a role, and while they could explain some of the variation in the weight gained by different people on similar diets, none appear powerful enough to explain the general trend. So what has happened? The light begins to dawn when you look at the nutrition figures in more detail. Yes, we ate more in 1976, but differently. Today, we buy half as much fresh milk per person, but five times more yoghurt, three times more ice cream and – wait for it – 39 times as many dairy desserts. We buy half as many eggs as in 1976, but a third more breakfast cereals and twice the cereal snacks; half the total potatoes, but three times the crisps. While our direct purchases of sugar have sharply declined, the sugar we consume in drinks and confectionery is likely to have rocketed (there are purchase numbers only from 1992, at which point they were rising rapidly. Perhaps, as we consumed just 9kcal per day in the form of drinks in 1976, no one thought the numbers were worth collecting). In other words, the opportunities to load our food with sugar have boomed. As some experts have long proposed, this seems to be the issue. The shift has not happened by accident. As Jacques Peretti argued in his film The Men Who Made Us Fat, we have been deliberately and systematically outgunned. Food companies have invested heavily in designing products that use sugar to bypass our appetite control mechanisms, and packaging and promoting them to break down what remains of our defences, including through the use of subliminal scents. They employ an army of food scientists and psychologists to trick us into eating more junk (and therefore less wholesome food) than we need, while their advertisers use the latest findings in neuroscience to overcome our resistance. They hire biddable scientists and thinktanks to confuse us about the causes of obesity. Above all, just as the tobacco companies did with smoking, they promote the idea that weight is a question of “personal responsibility”. After spending billions on overriding our willpower, they blame us for failing to exercise it. To judge by the debate the photo triggered, it works. “There are no excuses. Take responsibility for your own lives, people!”. “No one force feeds you junk food, it’s personal choice. We’re not lemmings.” “Sometimes I think having free healthcare is a mistake. It’s everyone’s right to be lazy and fat because there is a sense of entitlement about getting fixed.” The thrill of disapproval chimes disastrously with industry propaganda. We delight in blaming the victims. More alarmingly, according to a paper in the Lancet, over 90% of policymakers believe that “personal motivation” is “a strong or very strong influence on the rise of obesity.” Such people propose no mechanism by which the 61% of English people who are overweight or obese have lost their willpower. But this improbable explanation seems immune to evidence. Perhaps this is because obesophobia is often a fatly-disguised form of snobbery. In most rich nations, obesity rates are much higher at the bottom of the socio-economic scale. They correlate strongly with inequality, which helps to explain why the UK’s incidence is greater than in most European and OECD nations. The scientific literature shows how the lower spending power, stress, anxiety and depression associated with low social status makes people more vulnerable to bad diets. Just as jobless people are blamed for structural unemployment and indebted people are blamed for impossible housing costs, fat people are blamed for a societal problem. Yes, willpower needs to be exercised – by governments. Yes, we need personal responsibility – on the part of policymakers. Yes, control needs to be exerted – over those who have discovered our weaknesses and ruthlessly exploit them.